Unit in Duck Key next to the biggest resort in the Florida Keys! Located near stores, restaurants, delicatessen, bait and tackle shop, bank, jewelry store, and much more. Two marinas that you can use, rental of jet skis, kayak boat, sailing boats, snorkeling and fishing trips. You have access to the Gulf or Atlantic Ocean. Dock with fish cleaning station. Only minutes away from Marathon, Isla Morada, Bahia Honda Recreational Beach, Sombrero Beach and only 1 hour from Key West. The unit comfortably accommodate up to six people and are completely decorated. Master bedroom with queen-size bed and Bedroom #2 with TWO full-size beds. Large Kitchen/Breakfast area leading into beautiful spacious dining room overlooking the patio and POOL! Backyard BBQ, and 90 Feet of Dock Space on Canal. Property has two marinas that you can use. Bring your own boat!You can dock your boat right in your backyard in your 90-foot concrete private dock. You can fish from your backyard. Just bring your rods!! Charming, clean, and relaxing. Love the setting on the canal with the loungers and pool. We fished and had a visit from a manatee. The house is perfectly located to explore the Keys. We visited Sombrero beach, Bahia Honda State Park and Key West. The owner takes exceptional care of her property and greeted us when we arrived. My only regret is that we only booked for 3 days. We stayed at this location for 5 days. It was clean, had a great pool, and was well furnished with everything we needed. I will definitely come back to this location if/when I travel back to the Keys. We had a delightful visit in Mari's home. 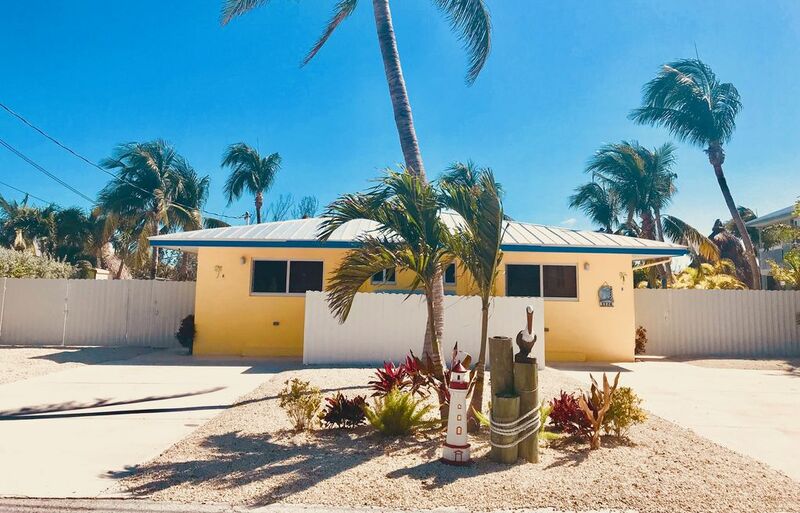 The location is perfect - right on a canal and driving distance to almost everything in the Keys. The outdoor space is well designed with a nice pool, cabanas and plenty of tables and chairs. Well equipped kitchen, comfortable beds and nicely decorated. We highly recommend! We had a wonderful time! The house was at a great location on Duck Key. We enjoyed our evenings out back on the patio over looking the channel and watching the sun set between the trees. We had a couple of things pop up, but Mari contacted us immediately. Her husband came on Christmas Day to check the pool for us. I’m always apprehensive when renting a duplex because we enjoy our privacy, but both sides were fairly secluded. The patio is big enough that my family was able to enjoy one side and the other family was able to enjoy their side without much interaction. There is limited space for food storage in the kitchen, but there is a nice island/bar there that we used to store our food. We cooked a lot in the kitchen and the outside gas grill. My only suggestion would be a couple of sharper kitchen knives and some food storage containers. The beds were comfortable too! We are already planning our next trip back and intend to rent here again. We didn’t take advantage of the boat dock, but plan to next time. Great vacation home owners very nice and helpful Mari and Fausto keep the property clean. Highly recommended family vacation home very nice decor nice dock space great back yard to BBQ and fish with family. Perfect vacation spot in the Keys! We stayed in this duplex over spring break and had an amazing time. We liked it so much we are planning two additional trips to this same unit in the coming months. Both sides of the duplex are comfortable and very clean. We enjoyed the tiki hut during meal times and my kids enjoyed the pool. There is plenty of seating outside which was a plus. We caught 21 different species of fish off the large dock during our stay. Plenty of snapper for dinner! It was incredible fishing off the dock, cheap entertainment for the whole family! (Bait: Live Shrimp) Mary was great to deal with through the rental process. Duck Key is an ideal location for your Keys vacation. We did multiple day trips to the beaches and explored Marathon and Islamorada. I highly recommend this property. Dolphin Encounters & Beautiful Beaches!